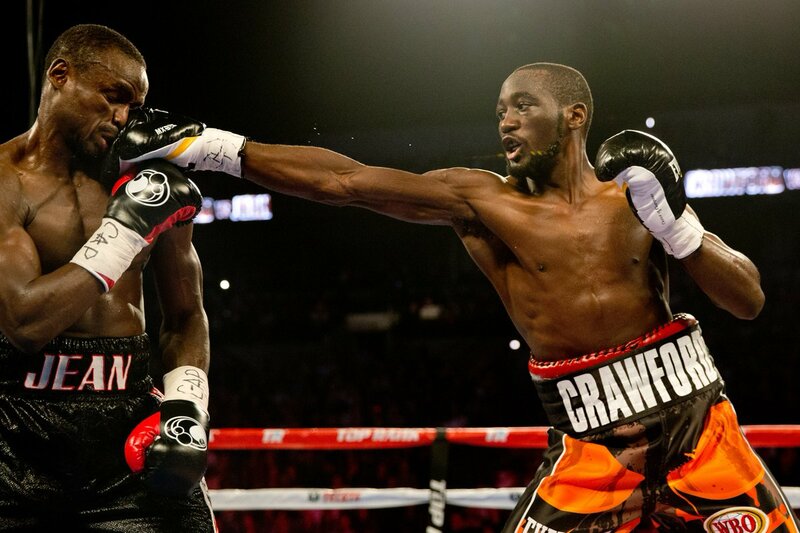 Terence Crawford wins again - stopping Dierry Jean by TKO with thirty seconds left in round ten. Crawford improves to 27-0 (19 KO). As was stated in the preview, a pattern has emerged whereby Crawford switches to southpaw against smaller opponents to control the range. That did not change against Dierry Jean (29-2, 20KO). Only this time, Crawford made the switch to southpaw in the first round. The early switch suggests that he had planned it all along once he used his natural stance, orthodox, to measure his opponent. Little was happening in the first round. Both fighters tried to land their jabs. Jean's jab was always inches short, but it was disruptive enough for Crawford that he was not mounting an offense. So, by switching to southpaw, Crawford neutralized the jab of the shorter and short-limbed Jean by jabbing and hooking over his jab. Once Jean threw less jabs, along with the distance he had to cover to land the right hand, Crawford was able to time Jean's right with his own counter left hand. Jean was knocked down with less than ten seconds remaining in the first round on a counter left followed by a right hook. With 1:25 left in the fourth round, Crawford hurt Jean with a left hand followed by a cross jab from southpaw. Jean spent the remaining of the rounds trying to keep away from Crawford. 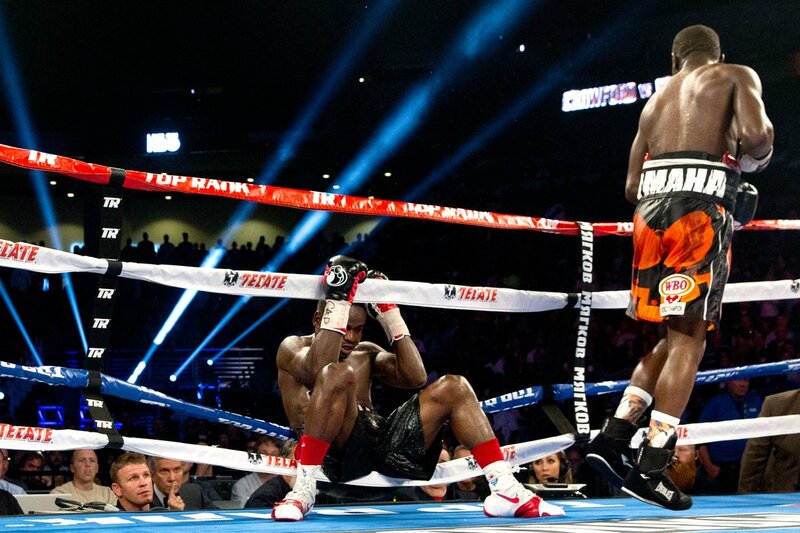 In the sixth round, Crawford switched back to orthodox midway, landing hard power shots with his right hand. Seemed as if Crawford was trying to finish things at this point but backed off not wanting to punch himself out...where he once again turned back to southpaw in the last ten seconds. At the end of round nine, Jean missed Crawford with a straight right hand that caused his body to rotate his body away from Crawford where Crawford then landed a left hand to the back of the Jean's head, followed by another one-two combination that sent Jean down for a second time. Jean's legs were shot but he was able to get up at a count of eight. Jean was still shaken up with wobbly legs to start the tenth round. Crawford was aggressive the entire time and showed a more fluid switching up between orthodox and southpaw as he started landing hooks to the body and uppercuts while Jean was against the ropes. Eventually, Crawford knocked Jean down into the ropes with thirty seconds left and the referee waved off the fight. Top Rank, Inc. man-in-charge, Bob Arum, who is promoter to both Terence Crawford and Manny Pacquiao, has said the plan is for Manny Pacquiao to fight Terence Crawford in April as Pacquiao's last fight before retirement. Pacquiao was also rumored to be in negotiations with Amir Khan and Lucas Matthysse. Due to his ties with Al Haymon, Arum will probably want to avoid any dealings with Khan. Going with Matthysse would seem to be a favor to Golden Boy's Oscar De La Hoya. Crawford is with Top Rank and is the preferred opponent for Pacquiao. Arum has apparently thrown Pacquiao to the wolves, after publicly criticizing him and his viability moving forward, and would like to build Terence Crawford's star power on worn-out Pacquiao. As Floyd Mayweather has said, Bob Arum "has moved on to the next."